The story still haunts – and compels – us. A few years ago, friends of ours had set out to attempt something that no one in modern times ever dares to attempt: paddle from the Prairie Creek/Camps Canal take-out point (the Rt. 234 bridge) downstream to the River Styx. In all my years of paddling Camps Canal, I had always assumed (as a result of looking from the bridge, and from reports I had gotten) that downstream was overgrown and impassable. That the route had not been maintained or cleared since logs were hauled along it several decades ago. But then, a few years ago, a story emerges from friends who actually decide to do what they can to open up a paddle trail from the bridge to the River Styx downstream (one of whom "just happened to have brought along a chainsaw to cut through downed trees obstructing the route"). The effort turned out to be a fiasco, as this courageous party ended up getting lost in the River Styx swamp and had to spend the night in their canoes in the marsh-like morass. The bungled mission scares us, but motivates us as well. "There MUST be a way to navigate from the Canal to the River Styx, as long as proper conditions and proper navigation are used." Then, in early February, we see an opportunity. The past few days drop an unusually large amount of rain in the area (over four inches). And mid-winter cold weather has certainly killed off the intolerable swarms of insects that normally make such swamps unbearable. Not only that, but my friend has just upgraded to a much-improved sit-on-top kayak that enables much more convenient portaging. If ever there would be a chance to find a paddle passage from the north to the River Styx, this is it. Geared up for the coming skirmish, we slide our kayaks, for the first time ever, into the downstream portion of Camps Canal at the Rt 234 bridge. It is 1 pm on a cool, damp Saturday morning. Our paddling, at first, is quite tolerable. "This is going to be doable after all," we naively tell ourselves as we paddle toward our doom. Scurrying up the bank in front of me, early on in our paddle, are a couple of large, black otters. My friend quietly goes ashore to attempt to capture them on film, only to discover a large, flooded area flanking the canal on the other side of the old spoil bank, and the otters no longer in sight. Soon, we start confronting a taste of what is to come in this misadventure. Thick mats of vegetation start covering the canal, which obligates us to paddle strongly in order to pass through. Interspersed are a growing number of large trees which have fallen from the canal banks across the canal. In almost every instance, we must pull up alongside the downed tree, scramble onto the trunk from our kayak, then lift our kayak over the tree – without falling into the chilly water during this precarious balancing act. At first, these tree obstacles come every hundred yards or so. Quickly, however, we find that in front of us is a staggering number of downed trees. Every 150 feet. Then every 50 feet. Then every 10 feet. It is as if EVERY tree along the banks has come crashing down into the canal. Before long, we are exhausted and frustrated. And we have reached the committed point of no return. Going back upstream to where we started does no good, as we have behind us an enormous amount of portaging (knowing what we had just dealt with), and presume that there MUST be less work downstream in front of us than behind us. We therefore decide to press on and hope for the best. After approximately 1.5 to 2 hours of this downed-tree and dense vegetative mat quagmire, my friend starts turning to me to announce, with great relief, that the canal "ends just ahead." This turns out, on several occasions, to be a false hope, as the canal continues on despite its seeming end. What appeared to be an end is actually just a large clump of downed trees, or a slight bend in the canal. I find myself so exasperated by the constant tree portaging that on more than one occasion, I pull my kayak out onto the spoil bank and drag the kayak along the narrow, tree-littered embankment. I am, after all, a terrestrial species, not an amphibian. Exhaustion leads me to find relief dragging my boat on land rather than continuously struggling to contend with downed cypress in 4 feet of canal water. At long last, fighting fatigue, we actually reach the end of the canal approximately 2-3 miles downstream from our starting point. "At last, we have found relief," we tell ourselves, not realizing what an awful, fearsome, horrible swamp jungle lies before us. We zig zag our boats around some obstacles, which breeds early, unwarranted optimism. The River Styx swamp soon closes in on us, and we find ourselves in what looks more like a partially clearcut cypress forest than a waterway. What was a canal is now a foreboding, forbidding cypress swamp forest, interspersed with small pools and puddles of water. All efforts to stay out of the dark water are now abandoned as we pull our boats over and through the tree trunks and branches. 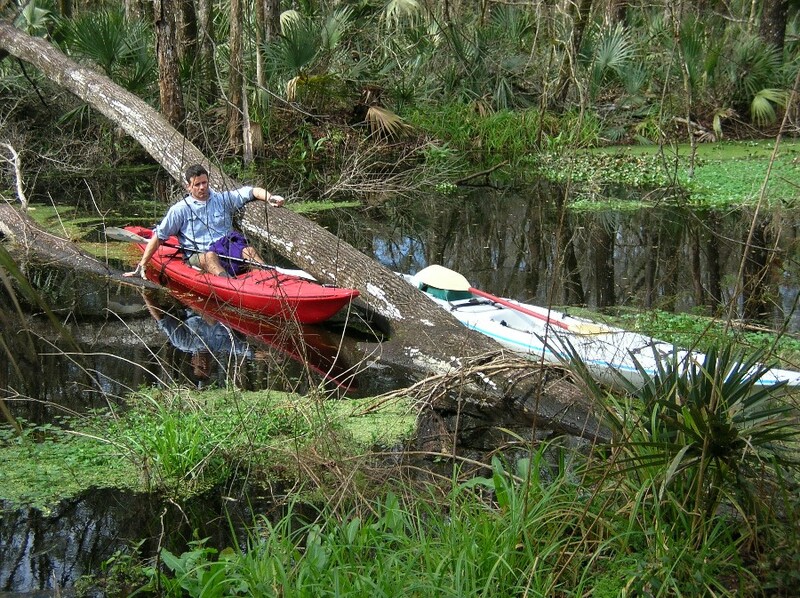 Pathetically, we climb onto our kayaks after each tree obstacle is overcome, grasp any branch or stalk within reach, pull and jerk our way for two or three feet, then dismount again to pull the kayak over yet another knot of trees and stumps and painful, prickly blackberry bushes. Our progress has slowed to the point where we are now moving forward at a speed of approximately 15 feet per 30 minutes. 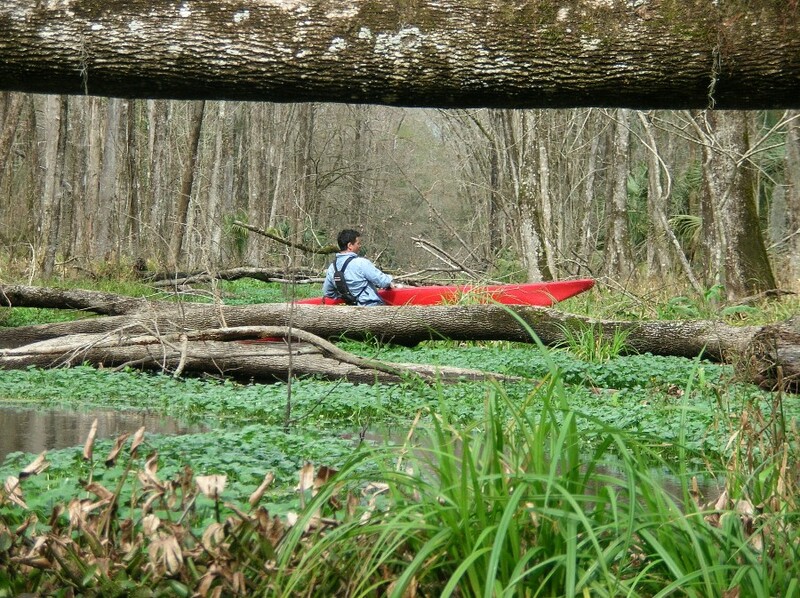 Much more of our time now is spent slogging in waist-deep swamp water – dragging our kayaks — than in our kayaks. My friend warns me that I should spend as much time as possible on the kayak, instead of trudging through the swamp water, as that would minimize my chance of a reptile attack. I agree, but almost immediately abandon his suggestion, as it is just too exhausting and futile to be on the kayak for two feet, then out of it to drag it over trees, then back on, then back off. Endlessly. I decide that it would be less ghastly to die in a fiendish reptilian attack than to engage in such snail-like madness. I return to trudging with my kayak behind me. I have, it seems, resigned myself to die with dignity. I retain some small sliver of optimism, however, as the sun still seems to be fairly high on the horizon ("surely we have enough daylight hours," I assure myself), and my friend regularly takes directional readings and promises me that our destination is "just ahead of us a short ways." This swamp slogging has now gone on for approximately an hour. I am astonished that we have not yet become delirious, but instead retain a sense of humor. At one point, in the middle of what now seems an impossible, doomed task, I say to my friend, only half in jest, "Who’s idea was this, anyway?" By far, the most disconcerting thought I have is that we are wading through a Florida marsh. That is, a habitat that must be TEEMING with large, aggressive alligators and poisonous water moccasins. Pitifully, I poke my kayak paddle into the water in front of me, and hope that in combination with all the noisy thrashing I’m doing as I struggle through the muck, I will have scared off these fearsome Florida demons. I think regularly about a botanical garden manager at a park a few miles to our west who was cleaning out a pond a few years ago and accidentally stepped on a large gator, and who ended up having his arm torn off in the ensuing death struggle. He survived, but his arm, sadly, did not. I conclude, remorsefully, that my chances of stepping on a ferocious gator in this murky swamp are nearly certain, and that I’d have zero chance of surviving the resulting attack that I had unintentionally provoked, and which was certain to come. Even if I somehow manage the impossible and avoid such a terrifying gator attack, I am well aware of the fact that in a place not far from our present quagmire, my dog had been twice bitten by a water moccasin in a creek. Fortunately, we were able to rush him to an emergency room within an hour, which saved his life. But here, the awful truth is that should I step on and get bit by a poisonous snake, it would be impossible for me to escape this seemingly endless swamp in anything less than two or three hours. And even if dumb luck was on my side and I DID manage such an escape, it would be quite a while before a vehicle was hailed and I could be rushed to a hospital. Surely, therefore, a snake bite would be fatal. I resign myself to the certainty that I will die an ugly, terrifying death in a gator assualt, or die slowly and painfully from a snake bite. Several times, I mutter under my breath that I'm not having fun anymore. And all this after I had been warned, the day before, to be very, very careful not to get hurt on my upcoming kayak trip. Oh, how I had disregarded that advice! And wish I had heeded it. Miraculously, no snake or reptile battles occur during our ill-fated struggle to survive. There is now no margin for error. I become horrified by the thought that it seems certain we will join the fate of our friends in their quest a few years ago. We would be spending the night in our kayaks in the middle of a dark, dreary swamp. The weather forecast that morning told us that the low tonight would be 30 degrees. Alligators and snakes might not get us, but in our soaking wet clothes, we’ll surely die of hypothermia. The fleece pull-over I had decided to bring along "just in case" had been put in my kayak hatch compartment earlier due to the warm sun, but was now soaked in cold water in that flooded hatch and therefore useless. I begin to worry that my life insurance has not been paid up. Will it provide needed sustenance for my wife after I die in this god-forsaken swamp? (a swamp which, in my doomed misery, I have now dubbed "Widow-maker Swamp"). With the sun setting, I start getting a bit panicky. In desperation, my movements become more forceful. Stronger. "I must reach a take-out point before darkness envelopes us. I must find every ounce of remaining energy to save myself. To minimize how long it takes to find sanctuary." I think back to an article I had just read about the personality of a "survivor." When one gets in trouble in an outdoor adventure, the article asked, some people are survivors and instinctively know what to do to survive. Others are not survivors. They panic and start making rash decisions that end up spelling their doom. In our case, such a panicked response would be, say, abandoning our kayaks and frantically clawing our way as fast as we could to reach higher, drier ground. But I conclude that this would not be survivor strategy, as one is much more likely to survive the night in a swamp if one stays with their kayak (and thereby be out of the chilly swamp water). This realization comes fairly easily to me because I have now spent an interminable amount of time staggering through a slimy muck that is so soft that I often find myself sinking to my knees in the gooey swamp bottom. Spending the night in my kayak – while not warm and cozy like my bed – would be infinitely more pleasant than a night floundering, deliriously, in mushy bog. Another agonizing thought crosses my mind: Are not gators MORE active and aggressively seeking food/prey AT NIGHT? Our hopeless swamp slogging has now gone on for three seemingly unending hours. We look up into the sky above us. A flock of hundreds of vultures circle overhead. "Those guys are in WAY over their heads," the hungry birds are obviously saying to themselves as they expectantly and cruelly look down at our struggling journey. "We are going to eat like kings tonight!" Just when it seems like we will not come out of this alive, we start noticing our first hopeful signs in a number of hours of struggle. THE WATER IS GETTING DEEPER. I am elated, as this surely means we our near our long-awaited destination. Then, my friend announces what I’ve anxiously hoped for hours. He has spotted the railroad trestle embankment. From there, it will be a simple few miles of carrying our boats to the road, where we will be picked up by my friend’s wife. Or so we had assumed. He discovers that his cell phone is out of reception range in our remote location. We walk, with hands numb from the cold air, for about a mile, though, and gloriously, he reaches her. The experience was, well, horrific. But having emerged without succumbing to the black lagoon, I am now much more appreciative of being alive. Upon our return to the land of the living, I learn about the spine-chilling story that the "river Styx" comes to us from Greek mythology. According to fable, the river Styx is the river of which many know its name, without knowing its origin or what it really stood for. A river that separates the world of the living from the world of the dead. Styx it is said winds around Hades nine times. Its name comes from the Greek word stugein which means hate, Styx, the river of hate. In the Iliad, the river Styx is the only river of the underworld. The river Styx was always the best known, and the most sacred, of the rivers in Greek mythology. To the Gods, there was no oath more sacred than to swear by the river Styx. Some said the river was so foul that to drink of it brought instant death. Or that the god would lose his or her voice for nine years. Some said it bubbled with fire. This river Styx served as a crossroads where the world of the living met the world of the dead, and the world of the mortal met the world of the immortal. Greek mythology gods, mortals, and great heroes and villains made their way across the river Styx. Some crossed the river many times, but for most, it was a one way trip. We intend to return to PADDLE the remaining one-quarter mile we had in front of us from the rail trestle to the open water, just to say we had successfully negotiated the "route." We hope it will not turn out, this time, to be the river of no return. That we will not find it to be the river of hate. That we will return from the world of the dead. In any event, we now have reached an unassailable conclusion. 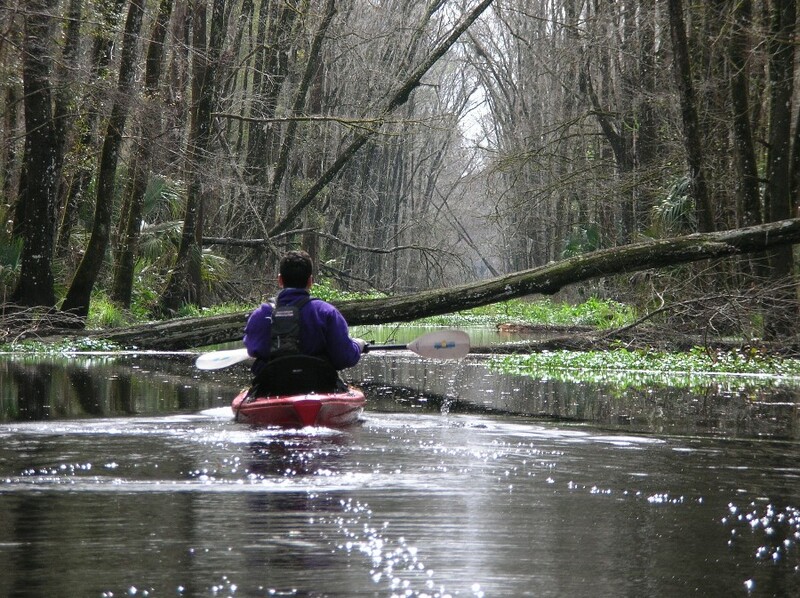 Camps Canal to the open portion of the River Styx is NON-NAVIGABLE BY KAYAK. A river to be feared. Even by the gods.